180 Marlborough is located on the south side of Marlborough, between Dartmouth and Exeter, with 178 Marlborough to the east and 182 Marlborough to the west. 180 Marlborough was designed by architect Samuel D. Kelley and built in 1880-1881, one of two contiguous houses (180-182 Marlborough) built for speculative sale. 180 Marlborough was built for N. Henry Chadwick and Oscar L. Stillings. Their firm – Chadwick & Stillings — was originally a hat block and flange company and became a significant house contractor and builder in the 1880s and 1890s. Chadwick & Stillings is shown as the owner on the original building permit application for 180 Marlborough, dated June 7, 1880. 182 Marlborough was built for Oscar Stillings’s father, Samuel Stillings, a carpenter and builder, who is shown as the owner on the original building permit application for 182 Marlborough, also dated June 7, 1880. He also is shown as the builder of the house (no builder is identified on the permit application for 180 Marlborough, but it probably also was built by Samuel Stillings). The land for 180-182 Marlborough was purchased on September 27, 1880 (probably after the houses were under construction) from Thomas Jefferson Coolidge, the land for 180 Marlborough purchased by Chadwick & Stillings and the land for 182 Marlborough purchased by Samuel Stillings. Both lots were part of a larger parcel that T. Jefferson Coolidge and James Lawrence had purchased on May 15, 1872, from the Commonwealth of Massachusetts (T. Jefferson Coolidge had purchased James Lawrence’s interest on December 30, 1872). 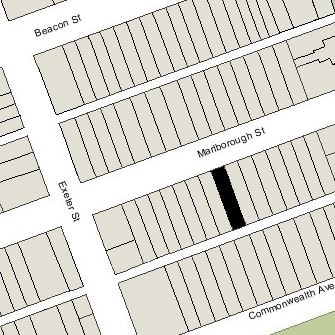 Click here for an index to the deeds for 180 Marlborough. The original houses probably were a matched pair, with 180 Marlborough having been altered significantly over the years and 182 Marlborough remaining as it was originally built. The 1887 Sanborn map indicates that both houses were four stories (plus basements), each with a mansard roof and an octagonal bay on the western side. The 1902 Bromley map confirms that the houses remained the same, but the 1908 map shows that an additional story had been added to 180 Marlborough. In 1925, it was further remodeled to eliminate the bay, lower the front entrance, and “modernize” the front façade. On September 23, 1881, 180 Marlborough was purchased from N. Henry Chadwick and Oscar Stillings by Dr. Samuel Jason Mixter. He and his wife, Wilhelmina (Galloupe) Mixter, made it their home. They had married in August of 1879 and previously had lived at 219 Beacon with his parents, William and Mary (Ruggles) Mixter, and in Europe (their son, William, was born in Vienna in December of 1880). Dr. Mixter was a physician and surgeon, and maintained his medical offices at 180 Marlborough. The Mixters’ sons — William Jason Mixter, Charles Galloupe Mixter, George Mixter, and Samuel Mixter — lived with them. William and Charles Mixter both became physicians and maintained their practices with their father. George Mixter became an electrical engineer, and Samuel Mixter became a bond broker. William Mixter married in September of 1911 to Dorothy Fay and they moved to an apartment at 295 Commonwealth. Charles Mixter married in October of 1911 to Helen Worthington McIntosh and they moved briefly to 17 Exeter and then to 247 Beacon. Both continued to maintain their medical practices at 180 Marlborough with their father. George Mixter married in August of 1914 to Muriel Eaton and they moved to 5 Brimmer. And Samuel Mixter married in October of 1916 to Anne Dudley Williams and they moved to 41 Pilgrim Road. In June of 1909, Samuel Mixter acquired 182 Marlborough. By the 1919-1920 winter season, the Mixters had been joined at 180 Marlborough by Samuel Mixter’s sister, Mary Ann Mixter, and niece, Dorothy Howard, the daughter of Daniel and Fanny (Mixter) Howard. They previously had lived at their family home at 219 Beacon. At about the same time, the Mixters’ son and daughter-in-law, William and Dorothy (Fay) Mixter, moved to 219 Beacon. They previously had lived at 42 Fairfield. Dorothy Howard continued to live with the Mixters until the fall of 1921, when she traveled to Europe. Mary Ann Mixter died in June of 1922 and Samuel Mixter inherited her property, including 219 Beacon and property in Hardwick. In about 1923, Samuel and Wilhelmine Mixter moved from180 Marlborough to 219 Beacon (William and Dorothy Mixter moved from there to Brookline). At the same time, Samuel retired from practice, and William and Charles moved their offices from 180 Marlborough to 270 Commonwealth. Wilhelmine Mixter died in January of 1925 and Samuel Mixter died in January of 1926. On December 2, 1924, 180 Marlborough was purchased from Samuel Mixter by Merrill Griswold. He and his wife, Lillian (Lowell) Griswold, lived at 13 Marlborough. A lawyer and financier, was a founder of the Massachusetts Investors Trust in the mid-1920s, and of the American Research and Development Corporation in 1946. On the same day, Merrill Griswold conveyed 180 Marlborough to Eliot Wadsworth. He and his wife, Nancy (Whitman) Scull Wadsworth, made it their home. An engineer and financier, Eliot Wadsworth was associated with the firm of Stone and Webster until 1916, when he resigned to become the executive head of the American Red Cross in Washington DC. From 1921, he served as Assistant Secretary of the US Treasury, resigning in 1925 to return to Boston. He later served as a member of the Massachusetts Legislature. While in Washington, the Wadsworths had maintained their Boston address at 382 Marlborough with his sister, Lucy (Wadsworth) Sullivan, the widow of Thomas Russell Sullivan. 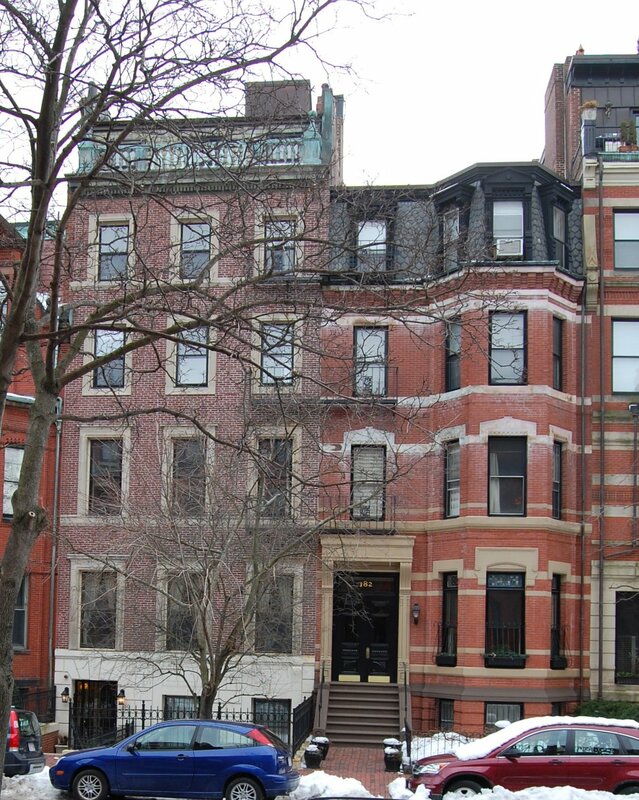 When they returned to Boston, they purchased 180 Marlborough as their home. Before moving to the house, the Wadsworths had it significantly remodeled. The remodeling was designed by architects Bigelow and Wadsworth (Philip Wadsworth of the firm was Eliot Wadsworth’s brother), and built by F. L. & C. E. Whitcomb, Inc., contractors, and included tearing down and rebuilding the entire front with a street level entrance (instead of first floor entrance), rearranging the rooms at the entrance, installing a new chimney flue, and installing an electric elevator. In his Houses of Boston’s Back Bay, Bainbridge Bunting incorrectly indicates that this work was done to replace the original house with a five-unit apartment building; however, the Wadsworths occupied the house as a single-family dwelling. The Wadsworths also maintained homes at Eastern Point in Gloucester and in Northeast Harbor in Maine. In 1929, the Wadsworth further remodeled 180 Marlborough to add an additional story to the rear bay. The remodeling was designed by Bigelow, Wadsworth, Hubbard, and Smith. The Wadsworths continued to live at 180 Marlborough until about 1939. On October 1, 1940, 180 Marlborough was purchased from Eliot Wadsworth by real estate dealer Henry J. O’Meara. 180 Marlborough was shown as vacant in the 1940 and 1941 City Directories and was not included in the 1940 and 1941 Lists of Residents. The property changed hands and on January 21, 1941, 180 Marlborough was acquired by Theodore Francis Berghaus, a realtor. He and his wife, Genevieve V. (Mahoney) Berghaus, made it their home. They previously had lived at 13 Gloucester, which they had converted into apartments in 1936. In March of 1941, Theodore Berghaus filed to convert 180 Marlborough from a single-family dwelling into ten apartments. The change was approved by the Board of Appeal in May, with a series of provisos, but the permit was subsequently abandoned. In May of 1941, Theodore Berghaus filed for (and subsequently received) permission to convert the property from a single-family dwelling into a lodging house. Theodore and Genevieve Berghaus continued to live at 180 Marlborough until about 1947, when they moved to West Palm Beach, Florida. They continued to own 180 Marlborough and 13 Gloucester. On December 8, 1948, Theodore Berghaus transferred 180 Marlborough into his and his wife’s names. On August 13, 1978, the Berghauses transferred 180 Marlborough to their daughter, Genevieve Patricia (Berghaus) Drummey, a resident of Washington DC, the former wife of John David Drummey, a public relations consultant, author, and cartoonist. The property subsequently changed hands, and on September 28, 1981, was purchased by James A. Magner, III, trustee of the 180 Marlborough Street Trust. In November of 1981, he filed for (and subsequently received) permission to convert the property from a lodging house into five apartments. 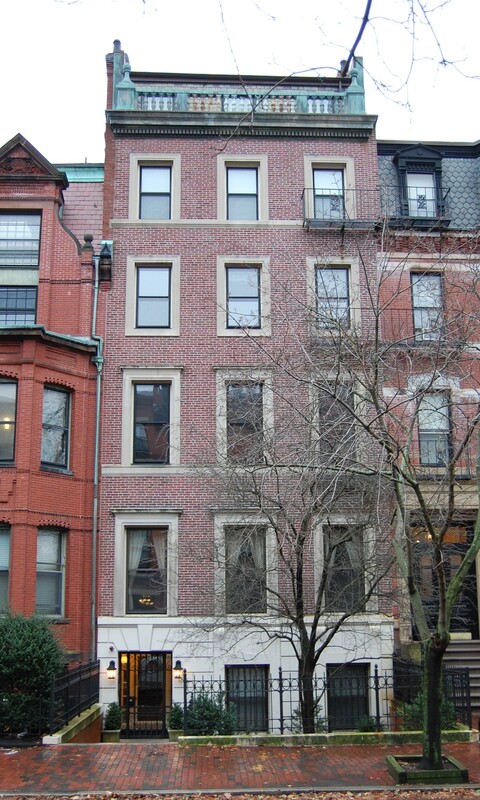 On March 18, 1982, he converted the property into five condominium units, the 180 Marlborough Street Condominium.. In February of 1983, William Buckley, who had purchased Unit 3, filed for (and subsequently received) permission to erect a one-story addition on the existing rear ell.